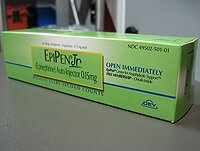 Sharing an article related to Epi-Pens. Important to have access to in case of emergency. Florida recently updated their law allowing schools to stock Epi-Pens. Now is a good time to re-consider the availability of Asthma Inhalers. It’s so very hard when a student says their inhaler is in their gym bag located somewhere in a locker room in a bag that looks like everyone else’s. ATLANTA — A policy of stocking spare epinephrine autoinjectors in Chicago Public Schools resulted in 38 emergency — and possibly life-saving — doses being administered during a 1-year period, a new study shows. More than half of the doses were administered to children having a first-time reaction, with no documented allergy, said lead investigator Ruchi Gupta, MD, from the Northwestern University Feinberg School of Medicine in Chicago. “That’s a lot more kids than we expected, having no history of any kind of anaphylaxis,” she said here at the American College of Allergy, Asthma & Immunology 2014, where she presented the findings. First results were published online in the American Journal of Preventive Medicine, as reported by Medscape Medical News. “Making sure that schools have epinephrine autoinjectors, and that staff are trained to recognize anaphylaxis and know how and when to give epinephrine, is critical to the safety of kids with food allergy,” Dr Gupta said during an interview. She pointed out that most states currently have a law in place, or in the works, that allows schools to stock epinephrine doses that are not prescribed to a specific person. Physicians can prescribe the doses to the school, and nurses and other staff are authorized to administer the medication to anyone who they feel needs it. Chicago Public is the third largest school district in the United States, with 670 schools and more than 400,000 students. Its Emergency Epinephrine Initiative to stock undesignated autoinjectors in all schools was the first of its kind in a large urban school district. Because it serves a largely low-income area, only 4250 students (1.1%) had the proper documentation to be designated as allergic. Of those, only 51% had an emergency action plan on file, Dr Gupta reported. Of the 38 emergency epinephrine doses administered during the 2012 school year, 35 (92.1%) were for students and 3 (7.9%) were for staff. The school nurse administered 76.3% of the doses, other staff administered 18.4%, and 5.3% were self-administered. Previous research has suggested that only 25% of reactions at school are first-time incidents, but in this study, 55% of the reactions were first-time incidents, said Dr Gupta. Food, the most common trigger, led to 55.3% of the reactions, and the two most common foods were peanut (18.4%) and fish (13.2%). However, the trigger for a large proportion of reactions was unknown (34.2%). Clear, simple instructions should go along with self-injectable devices — the way it is for defibrillators. The number of first-time reactions is not a surprise, said Antonella Muraro, MD, from the Food Allergy Referral Centre at Padua General University Hospital in Italy, who is president-elect of the European Academy of Allergy and Clinical Immunology (EAACI). “Many first-time reactions occur at school, and it is difficult to estimate the real figures and severity because of a lack of awareness and recognition of symptoms, as well as a lack of training,” she told Medscape Medical News. Undesignated epinephrine in schools is a good idea as long as training of school staff is an essential component, said Dr Muraro, who is lead author of the new EACCI anaphylaxis guidelines (Allergy. 2014;69:1026-1045). “There is a high unmet need to design such structured training programs. This program must include regular training of all school staff, establishment of adequate policies at school, and identification and empowerment of key people to administer the drug and manage the emergency,” she explained. “Clear, simple instructions should go along with self-injectable devices — the way it is for defibrillators. The implementation of such programs would help limit the legal liability of the school staff. There are no potential risks with the drug itself, but a lack of adequate training could result in administration to the wrong patient,” Dr Muraro added. Dr Gupta also emphasized the importance of training, but she acknowledged that it is not always easy to assess the appropriateness of an epinephrine administration after the fact. “We really need a detailed report for every time it’s used. We need to make sure it’s being used appropriately,” she said. “It’s very difficult, even for physicians and parents, to recognize when anaphylaxis is occurring, so we want to make sure nurses and staff know how to recognize when to use epinephrine. You hope parents will be appreciative, and it’s not something that’s going to hurt the child most of the time, but it is an expensive medication and, for some parents, that’s an issue,” she explained. American College of Allergy, Asthma & Immunology (ACAAI) 2014: Abstract 44. Presented November 10, 2014.